Dr. Ali Ihsan has been practicing medicine for 25 Years since graduation with Bachelor degree of Medicine and Surgery (M.B.Ch.B) from Al-Mustansiriya Medical School in 1992. 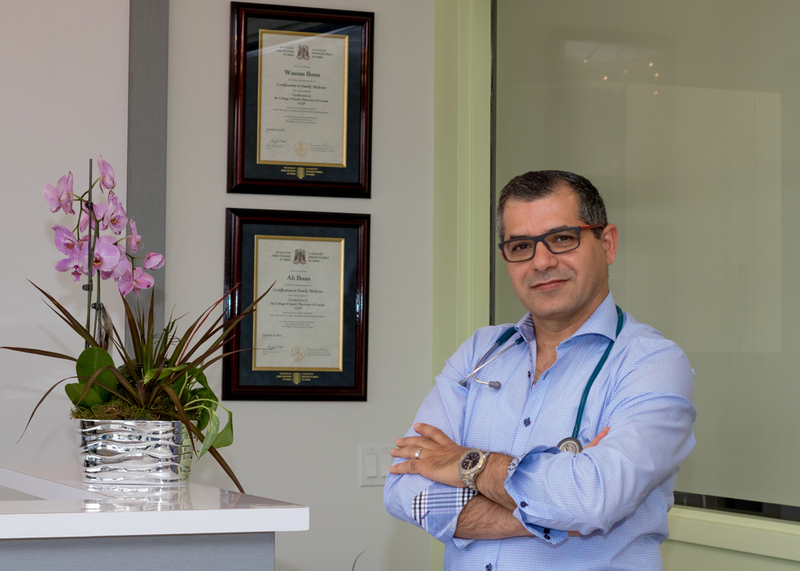 He has extensive knowledge and experience in Family Medicine including primary health care, preventative health care and minor surgical procedures. In 2008, Dr. Ali Ihsan moved to Ontario/Canada with his family Dr. Wassan Ihsan and 3 lovely daughters “Jumana, Dania and Rania”. 2010-2015, The Ihsan’s moved to Newfoundland and resided in the town of Bonavista and then in Clarenville city where Dr. Ali Ihsan worked in Emergency Department in Dr. GB Cross Memorial Hospital for 2 Years. In 2014, Dr. Ali Ihsan awarded certification of the College of Family Physicians of Canada(CCFP). He is also active in continuing education courses so he can improve the quality of care to his patients. When Dr. Ali is not in the clinic, he enjoys taking photos, gardening and planting, BBQing and biking. He is trying very hard not to be worse soccer player in his neighborhood! He loves spending more time with his family though his daughters are busy with their technologies! On top of that, Dr. Ali Ihsan is proud to take care of you.